Defense Minister lauds Iron Dome anti-missile system despite lethal missile that got through. Defense Minister Ehud Barak said Sunday that for whoever operates against Israel, "the chances are very high that his head will be separated from his body." Barak spoke as he toured one of the much-vaunted Iron Dome anti-missile system's launch sites. In the course of Barak's visit to the battery, the IAF attacked two targets in Gaza. Arab sources reported seven casualties at a Hamas position in northern Gaza. 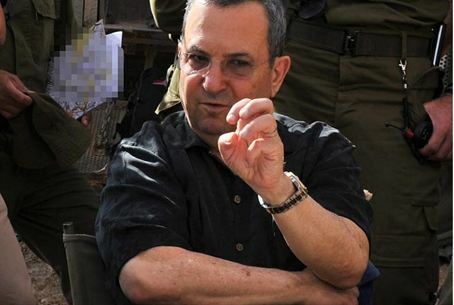 "Several days have passed since the terror attack last Thursday," said Barak. "The IDF is hitting hard at the perpetrators of this terror attack and those who supervised them and acts efficiently against the fire from Gaza into the southern communities." "This operation will continue with as much force and determination as is needed. We are only a few days away from a traumatic, painful attack. Most of the perpetrators died at the scene of the operation. "In a quick, sharp action, the committee heads who supervised the terror attack were eliminated. Since then we have carried out dozens of attack operations, including one this very moment," Barak said proudly. "There were over 100 launches," Barak said. "The percentage of interceptions is very high and very successful." A third Iron Dome system will be installed in a matter of weeks, and a fourth will be added by years' end," he said. "I have given instructions for a national emergency plan that will bring us to the end of 2013 with 9 batteries, thousands of missiles and the first part of Magic Wand – the layer above Iron Dome."